Observations of the feeding behavior of wild olive colobus monkeys (Procolobus verus)were made in southern Sierra Leone, West Africa. Most data came from systematically sampling one habituated social group, which inhabited old secondary rain forest on Tiwai Island. Olive colobus at Tiwai were highly selective feeders, obtaining most of their food from a small number of uncommon middle-canopy trees, from the forest understory, and from climbers. Mature leaf blades were largely ignored; young foliage (particularly of climbers) was a year-round dietary staple, while seeds, flowers, and mature leaf petioles were seasonally important. It is argued that this diet results largely from selection for two different attributes of food: high digestibility and physical location. Preferred foods had low fiber and tannin contents, while preferred feeding sites were in thick low growth and climber tangles. 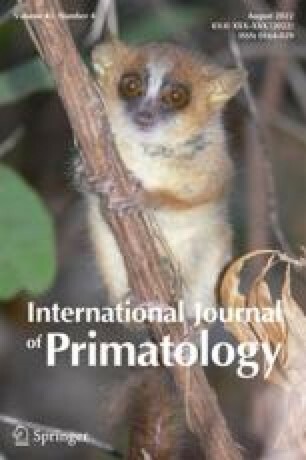 P. verusis the smallest extant primate species using a foregut fermentation system. Observations of its diet accord with inferences drawn from dental anatomy, digestive physiology, and considerations of body size.